Here's a quick mathematical diversion. 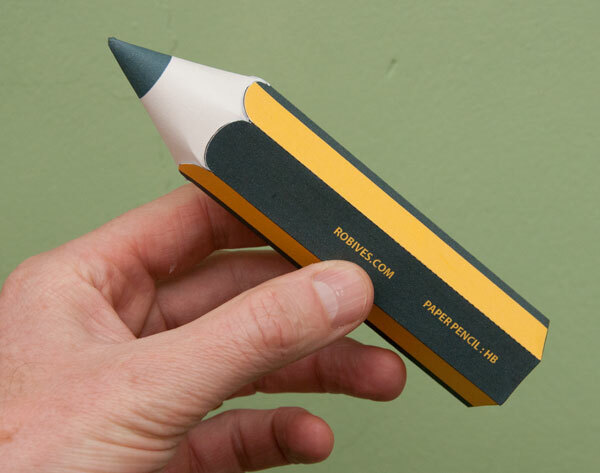 How would you make a pencil from paper? 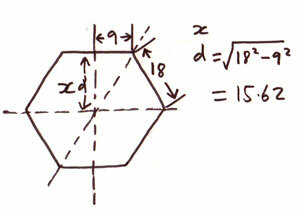 How do you join the hexagonal section of the shaft to the cone of the point? As is often the case, geometry has the answer. First step, the cone. 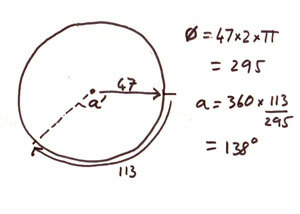 The radius of the base of the cone is 18mm, half of the 36mm diameter of the shaft. 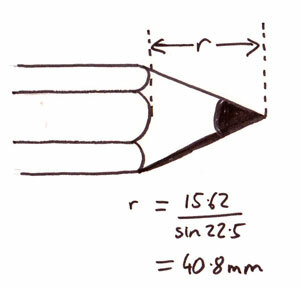 The length 'r' is 47mm, worked out using a sine. The length all the way round the base of the cone 'C' is 113mm. Remember those numbers, we'll be coming back to them. The cone is made from a pie slice of card mathematically know as a sector. 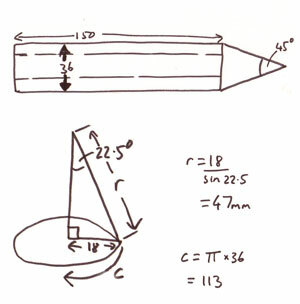 The angle of the slice determines the angle of the finished cone. The wider the angle, the flatter and less pointed the cone. Nearly there! Keep up at the back! We'll need some scallop shapes to link the hexagon tube with the cone. One more bit of calculation is needed to find the size of the scallop. Time to wheel out Pythagoras giving a value for x of 15.61mm. Having worked out all these dimensions I was delighted that the whole thing just slotted together nicely. I love the power of mathematics and geometry to work out how shapes fit together, its like having magic powers! Wooo! I'll be putting up the parts as a download shortly. Nessie next. That's quickly: I saw this nice picture today at Instangram with another nice photos, like a moving fox and I wonder if Rob has quick project for them. When I blinked there it was the pencil. Isn't it magic? 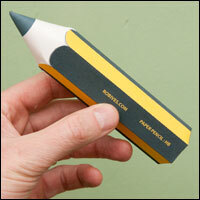 Delightfully pretty and a nerdy project – needs an eraser at the other end. ← …and the winner is.